The seveth CD in this Byrd edition is the first to feature music from the 1589 Cantiones Sacrae: the first eight motets of the collection are to be found here and the remainder on the following disc (vol. 8). Here Byrd enters an incredibly sombre world. 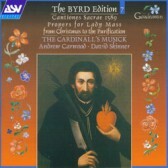 Persecution against Catholics by the government of Elizabeth I was at an all time high, and Byrd responds with a number of motets which explicitly address the unhappy Catholic community. Every piece is a gem but the anguish is particularly felt in Tristis et anxietas and the motet in four sections, Deus venerunt gentes, an expression of grief at the execution of Blessed Edmund Campion. To provide contrast there is a further installment in the Gradualia cycle, this time with the set of pieces for Lady Mass from Christmas to the Purification. Entirely different in mood and style, they represent compositions from later in Byrd’s prolific life.